Please PRE-ORDER Liberator #1 ! Hey guys, guess what? You can now pre-order Liberator #1! Q: Why would you pre-order instead of just waiting for it to be in stores? A: Because if there aren’t enough advance orders from comic shops then Diamond (the comic distributor) might cancel distribution of the series. 1. If you’re someone who goes to a comic store for your comics then please print this certificate and bring it to your shop to make it easy for them to order the book for you. Ask them to buy a couple for the store shelves too! 2. 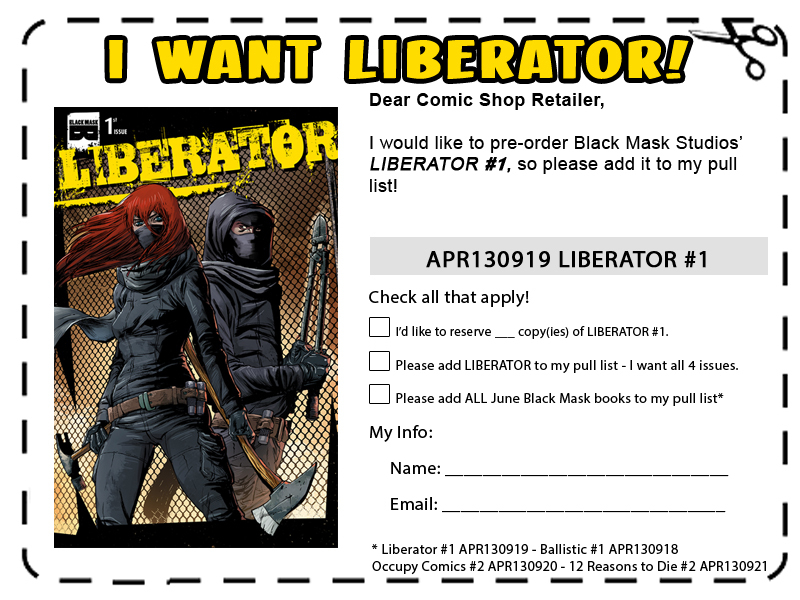 If you’re not a regular comic reader but you’re excited about Liberator and want to get a copy without having to figure out where a comic store is, or if you prefer to mailorder your comics, you can pre-order by mail from Midtown Comics! Thanks everyone, can’t wait for you to see this book! We’ve got a great series in store for you! ← Thanks for all the Liberator support, everyone!